This model of our new shoulder protection was made as stilization of Milanese spaulders – espalderium. 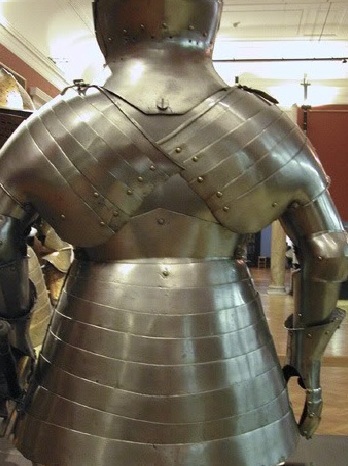 Segmental spaulders are smaller than historical spaulders which you can see on the Milanese armor of XV century. That makes them more comfortable to use. So called “wings” of Milanese spaulders were really big. 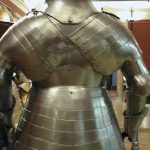 When knights stopped to use helmets with chainmail aventail the back wings of spaulders were so large that even could overlapping each other at the shoulder-blades. That idea was to reinforce the back plate. Our Segmental spaulders are articulated and movable. They are equipped with leather points with holes. You can easely fix them to your pdded gambeson. Also there’s a leather strap for proper fastening on your biceps.